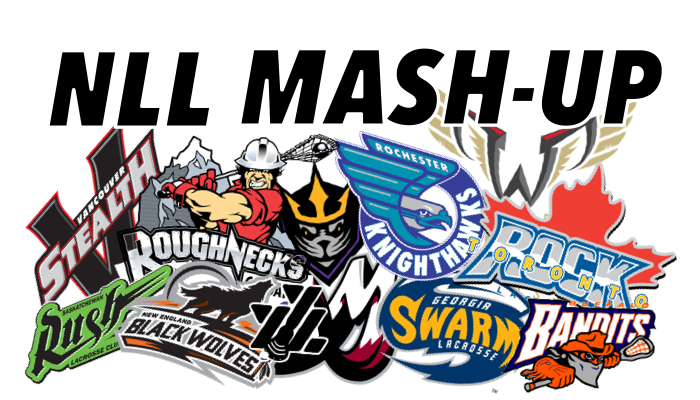 Well we have been on a couple week hiatus, but the MASH-UP is back! Nothing has really changed in that time as the entire East Division is within one game of each other. ROCHESTER, BUFFALO & GEORGIA are 8-7, while TORONTO & NEW ENGLAND are 7-8. Remember, only top 3 advance to playoffs. Three games left! Out West its 1. SASK, 2. COLORADO, 3. CALGARY, 4. VANCOUVER. That has been the line-up all season, we don’t see that changing. We have to start thinking about post season honors as the season winds down. Here is how we see the things going in the MVP race, there is still time to change things, but here is how we see it today as we give you our top five at this point. MARK MATTHEWS, SASK: The front runner is leading the NLL in points with (26g, 68a) 94 pts. I really like his passing game whether he is running the leagues best power play (71.4%) or throwing east/west lasers to the RUSH right handers. Can’t help but think that he is instrumental in the high goal totals and shooting percentages of ROBERT CHURCH (41g, 22.9 shooting %) and BEN MCINTOSH (37g, 21 shooting %). He was our preseason pick and has done nothing to lose his status as front runner. LYLE THOMPSON, GEORGIA: The reigning MVP got off to a slow start points-wise, but if you watch the games you know he has been the driving force behind the SWARM all season. Currently sits at 11th in scoring with (35g, 35a). The goals are 4th in the league. His GB game is strong as well with 108, that is the best among forwards. He has all the shots. Twisters. Dives, Outside Shots. He does it all. If he can lead the SWARM back into the playoffs he may come out on top. KEVIN CROWLEY, NEW ENGLAND: He is leading the NLL with 44g thus far. He has hat tricks in 11 games. There is been a lot of change in the BLACKWOLF offense all season long. CROWLEY has been the constant scoring, all of the big goals. If he leads this team to the post season he will have a great argument for MVP. He is the NLL's version of Taylor Hall of the NEW JERSEY DEVILS. He may be the best player in the league getting off his own shot. CODY JAMIESON, ROCHESTER: Last season the KNIGHTHAWKS had the worst offense in the league when JAMIESON missed the entire season. This season ROCHESTER is 2nd in the league in both Power play at 62% and Goals for 201. They trail only SASK in those two categories 71% PP & 213 GF. He leads their Power Play up top and is a clutch scorer. Also gave consideration to teammate JOE RESATARITS, but JAMIESON is the leader of the team and has the track record. This would be his second MVP. DHANE SMITH, BUFFALO: He is also gunning for his second MVP award. Trails only MATTHEWS in points as he has racked up 91 points (33g, 58a). If BUFFALO earns a playoff berth more than likely he will be a major factor. IMO, one thing going against him is that the BANDITS have a great supporting cast around him. Last week we went with all of the home teams and went 3-0. That puts us at 40-28, 59% for the season. This is a must win for the ROCK, the big question going in has to be TOM SCHREIBER and whether he is going to play. He was expected to suit up this past weekend, but didn’t. I wouldn’t think he would return unless he's at 100%, especially with the World Games upcoming this summer. That said if he does play I will go with the ROCK, if not I got the KNIGHTHAWKS. I see the ROCK transition players making a big difference as well. I think I got SASK. Conventional wisdom says it’s the MAMMMOTH, but the BLACKWOLVES have their back against the wall. Can KEVIN CROWLEY get enough support from CALLUM CRAWFORD and someone else on their left side? Last week it was JOHNNY POWLESS who stepped up scoring a couple including the winner in OT. COLTON WATKINSON and MARK COCKERTON impressed last week in transition as well. They will need a little offense from the back to put them over the top. COLORADO doesn’t have much to play for as they are locked into 2nd place in the West. I’m going with the BLACKWOLVES here despite the MAMMOTH blowing out the WOLVES a couple of weeks back. The BANDITS are coming off of a bye week and the ROUGHNECKS lost to NEW ENGLAND in OT. Sounds like a broken record, but BUFFALO has a lot more at stake as CALGARY is locked into the west playoffs. DHANE SMITH has put up at least 5 points in his last five games. I do have questions about the goaltending for BUFFALO and who will start, BUQUE or HIGGINS? Either way I like the home NECKS as their offense behind DICKSON should be able to outscore the BANDITS. The RUSH will be coming off a game with VANCOUVER night previous. I think they will be looking for revenge over last seasons title match up when the SWARM won the CHAMPIONS CUP on their home floor. As we mentioned earlier, LYLE THOMPSON is heating up at the right time. I don’t think it will be enough. I’ll pick SASK.